I love bread so much I rarely have it at home. I simply can’t delay my own gratification – I go full on Homer and eat entire loaves without pausing for breath. 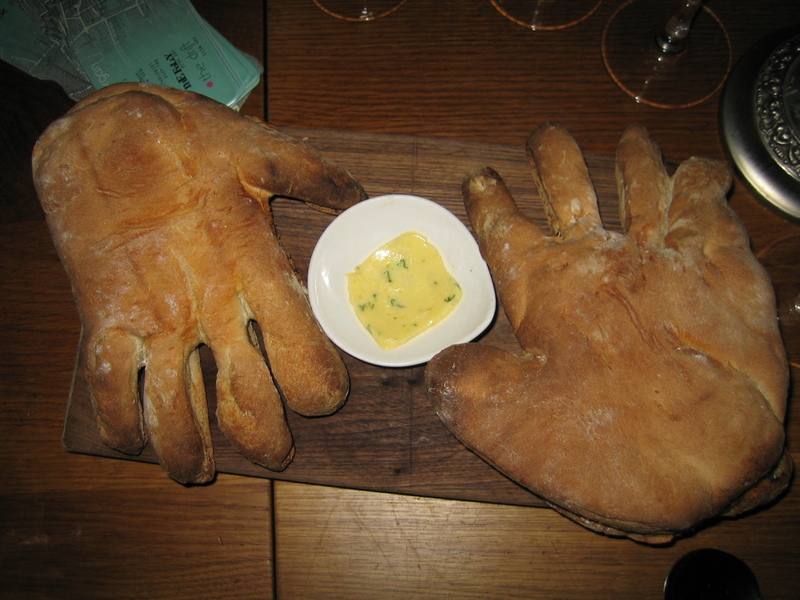 Jazzy bread hands, with a wild garlic butter, made by artist Sharon Baker, who casts other body parts in bread too – like these scary hands and feet which, come to think of it, might work well dipped into jam or honey. The last time I dipped my toes in some honey, my breakfast companion said it wasn’t the done thing at The Wolseley. What is it with young men nowadays? They embarrass so easily. – which I like for two reasons. Firstly, I love the size of this bread. 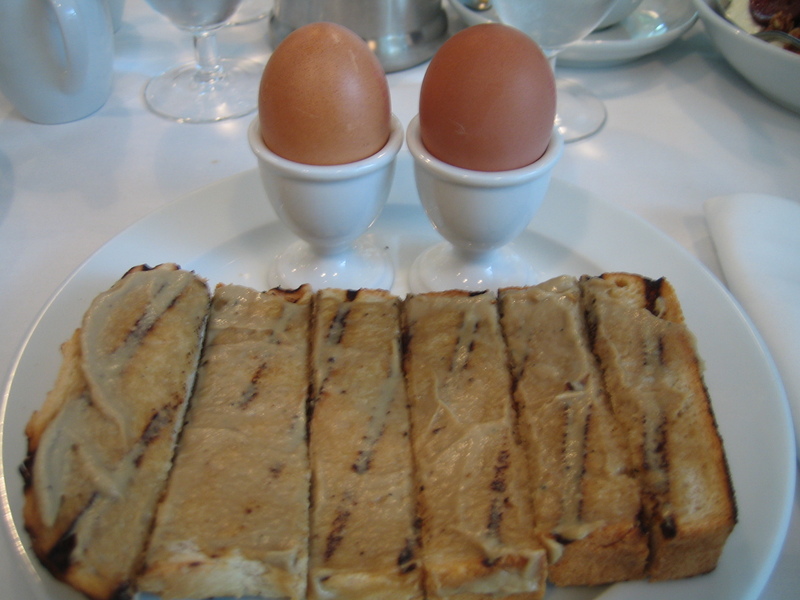 If I were a Guardian arts journalist, I’d mention how the juxtaposition of form, the elongation of what is essentially the humblest and most democratising of foods, is playfully extended, in the best tradition of post-modernism, to act as metaphor for consumer society – the Hummer of toasts, etc. However I’m not a pseud, so I shall merely say I LOVE BIG LONG WHITE BREAD THAT MAKES LOTS & LOTS OF SOLDIERS. The second reason I love this bread is that it is smothered in the saltiest paste imaginable – made of anchovies, shallots, vinegar and capers. My whole life seems to be one long Arthurian quest to seek out as much tasty salt and fat as I can find, and ingest it promptly thereafter, and this breakfast meets my needs admirably. < Previous Paris – good taste, good taste, bad.